Sad News from Gleision Colliery. It is tragic news that one of the four at Gleision Colliery near Cilybebyll, Pontardawe, has been found dead, but has yet to be identified. 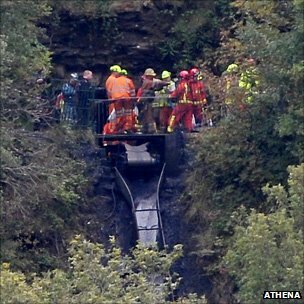 The four miners; Charles Breslin, 62; David Powell, 50; and Garry Jenkins, 39, from the Swansea Valley; and Phillip Hill, 45, of Neath, have been now trapped 90m below ground for 24 hours, despite valiant efforts to rescue them. It is easy that to forget that there are people who work in potential dangerous enviroments because they need to earn a living. Mining was once a proud industry of this country until Thatcher chose to close the mines and import coal rather than invest in our industrial heritage. My thoughts are with our working comrades and their families.